A special Thank You to Headline for sending me this book to review. What a great book! I've not read anything like this before. The idea is totally intriguing and new. I found myself trying to figure out all the in's and out's while reading, hoping to find my own escape for Kate. I'm a fan of Silas. In the beginning I thought he was awful, and I hated him. As the story moved on I realized he is more than meets the eye. I'm looking forward to learning more about him and finding exactly what he is all about. We find out why he is the way he is in the book, but I wonder how he will change and/or what he was like before. I also like Edgar. I secretly want some kind of romance to bloom with him and Kate. I'm a sucker for romance. I'll try and fit it in anywhere, but Edgar is this kind of hero that I want there to be much more with him. I'm awaiting the next book to find out! Well written, fantastic debut novel. 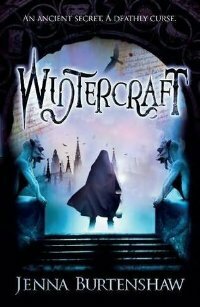 If you are looking for something a little different and dark check out Wintercraft!